Part Two — The Food. Ha! What a lie that is! 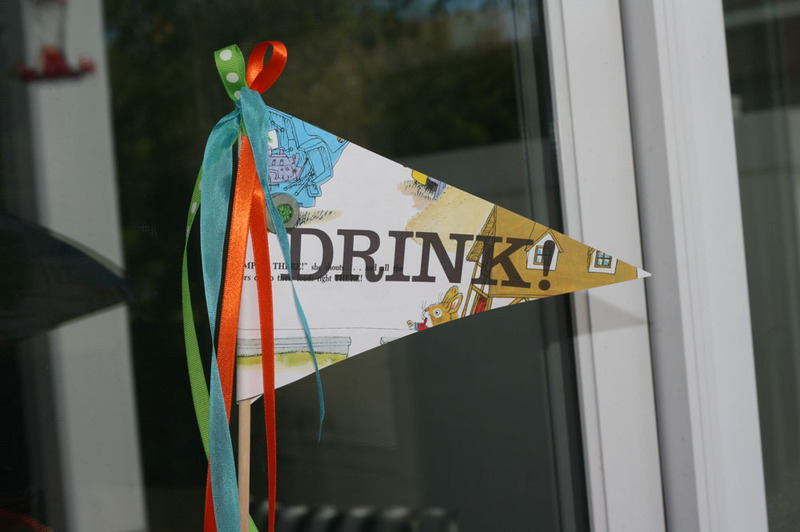 If you’ve followed this blog for awhile, then you’re well aware that the whole food part of parties is totally not my forte! Thank goodness I know how to use a phone and call for pizza! 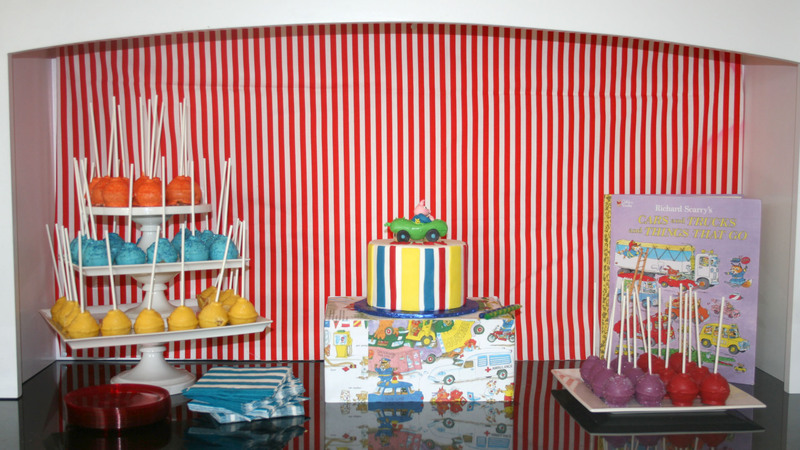 So while, this is technically the “food” post for this party, we’re starting with the showstopper… The Pickle Truck Cake! Ever since I spotted their work at the Olivia party last summer, I have used and abused the insanely talented Alicia and Sarah of The Crimson Cake. I highly suggest that you do the same if you’re a Southern Californian. It seems there is nothing they can’t do! 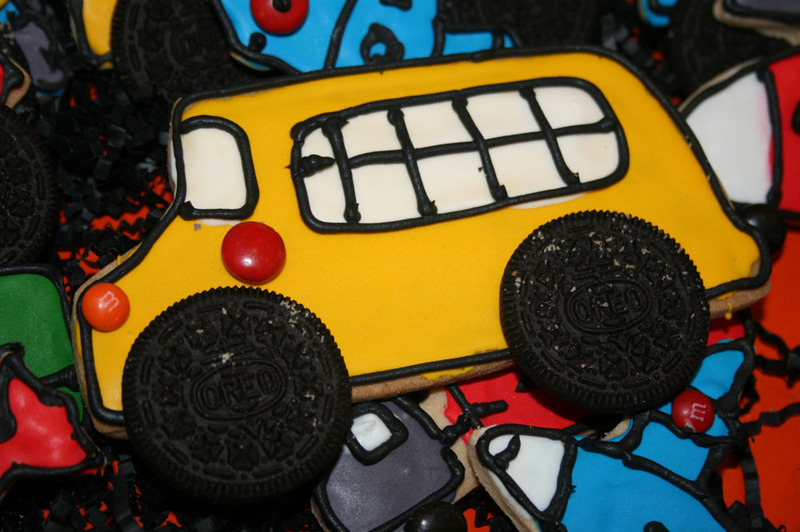 Their reaction to “Can you please whip me up a pickle truck cake?” was “Oh my gosh! 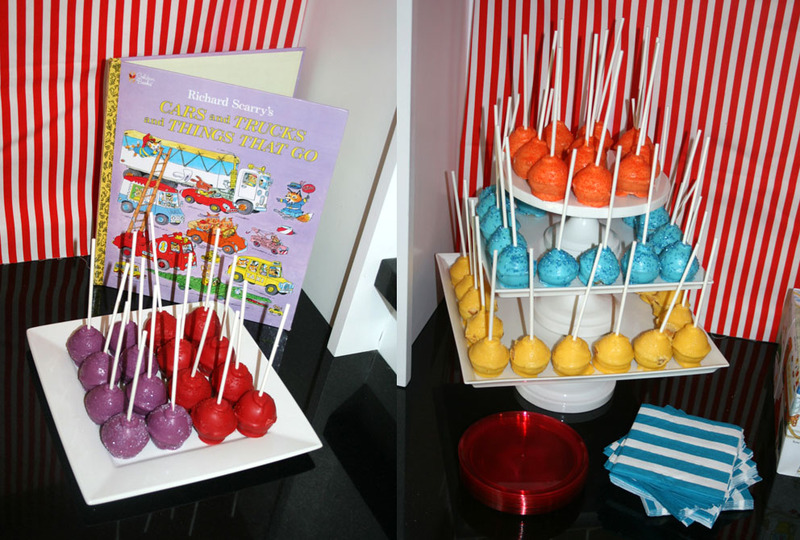 We LOVE Richard Scarry! We wish the cake was bigger so we could do more characters!” These are girls who are so passionate about their work and it truly comes through in the quality. 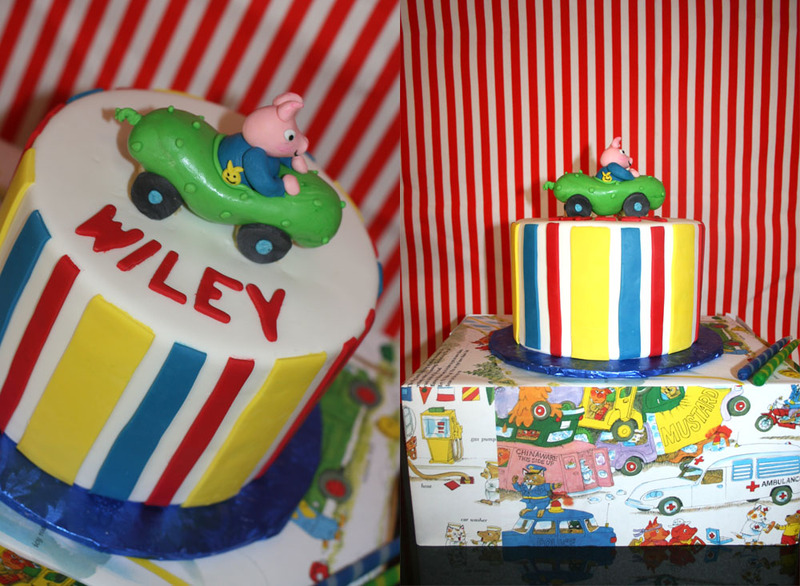 Of course since Wiley is so obsessed with pickle trucks, our choice was obvious when it came to the cake. It was adorable. 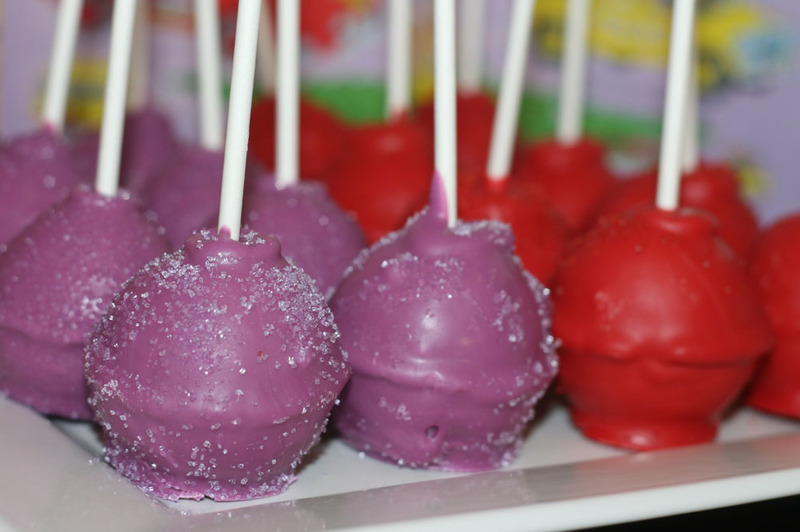 Now, please note, the (highly deformed) cake pops were NOT made professionally. (Hello, Captain Obvious!) I thought I’d give them a spin myself and once again it just goes to prove that we should leave the hard stuff to the pros. For me, these were the PITAs* of the party. But usually the PITA is always food related for me. I just don’t enjoy it. I call them UFO pops. What’s up with that ring? Who knows! But at least it was a “Things That Go” party. UFOs fit right in! The photo above were the good looking ones. But most of them legitimately looked like this. I’m sooooooo good at this stuff. Such a beautiful piece of art. Thankfully when grouped all together, it was hard to see how bad they really looked individually. 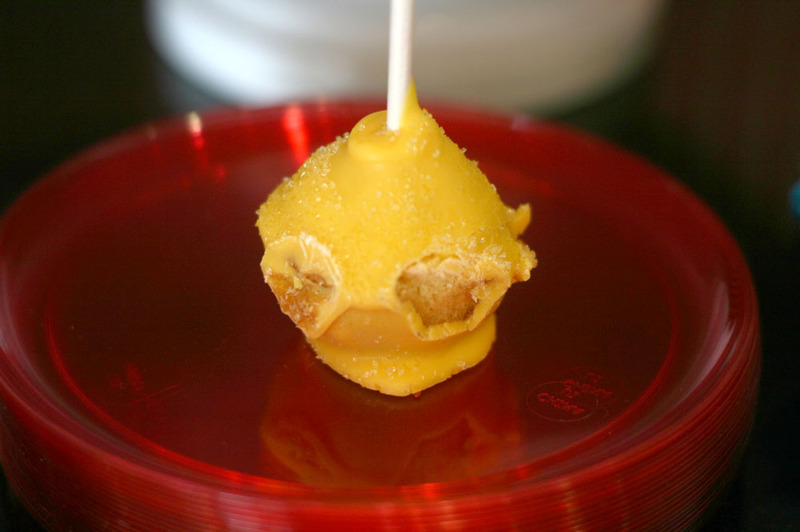 Plus, shouldn’t every cake pop have a little character? I certainly did not get my mom’s skill when it comes to making pretty things to eat. 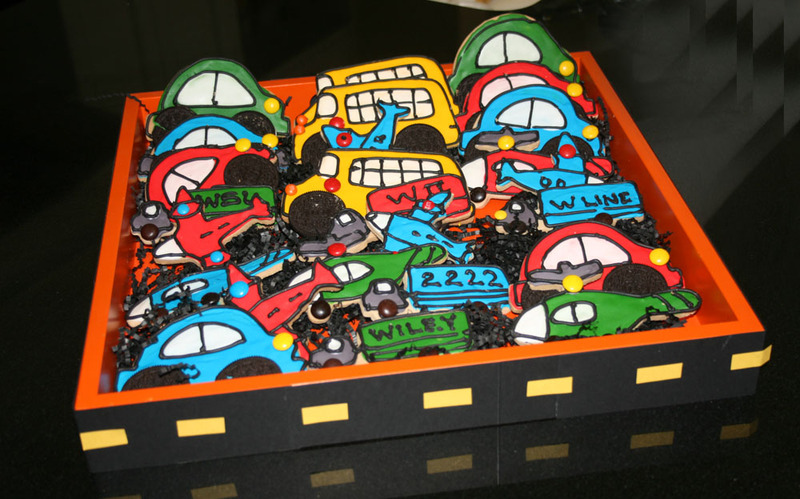 Crafty Jan whipped up these adorable “things that go” cookies! Now, she should actually go into business! 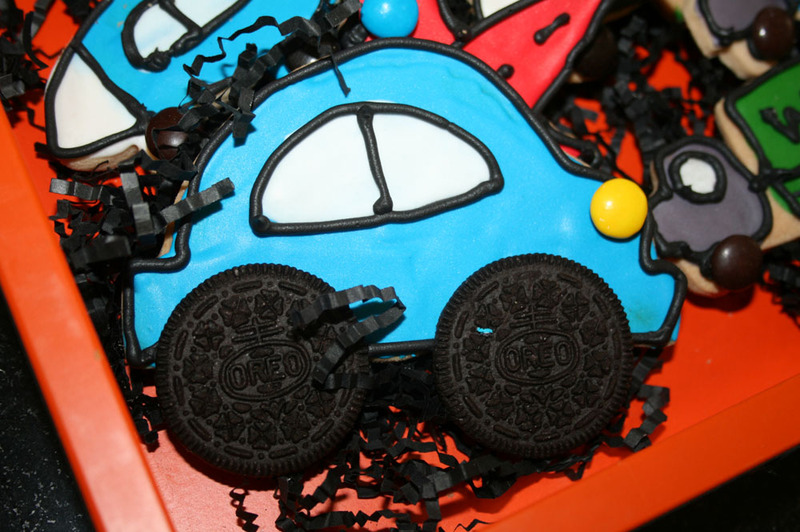 Oreo wheeled cars! 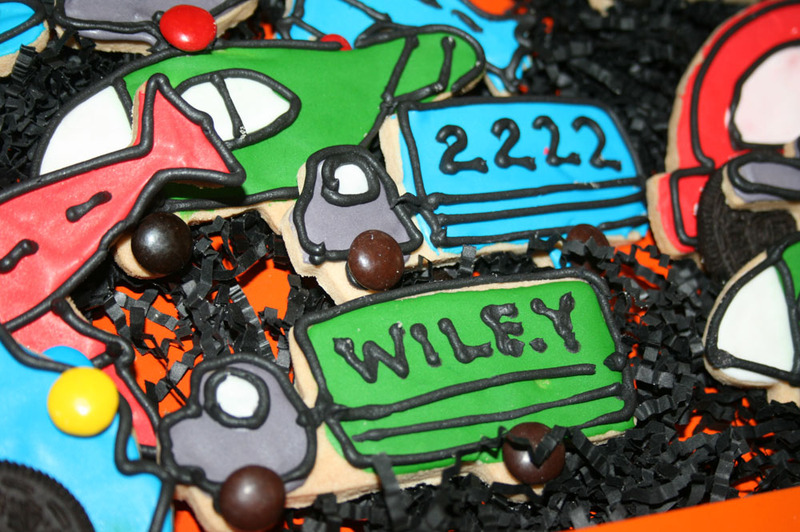 Wiley Mack trucks! Big honking buses! And airplanes and helicopters too! She blows my mind! Oh – so that was the dessert… did we actually eat? Yep – but I totally phoned it in. Literally! I ordered 12 large pizzas (they all went! 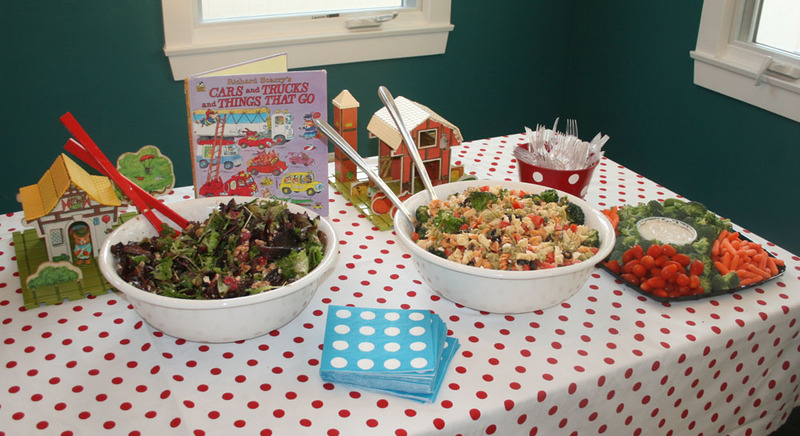 ), made pasta salad a raspberry-blue cheese green salad and called it a day. Costco veggie trays rounded out the selection and I’m pretty sure everyone’s tummies were just as happy as they would have been had I slaved away in the kitchen for days. I guess my advice is pick what you’re good at and fake the rest. Hee hee! We had tons of beer, wine, juice boxes, and water bottles. 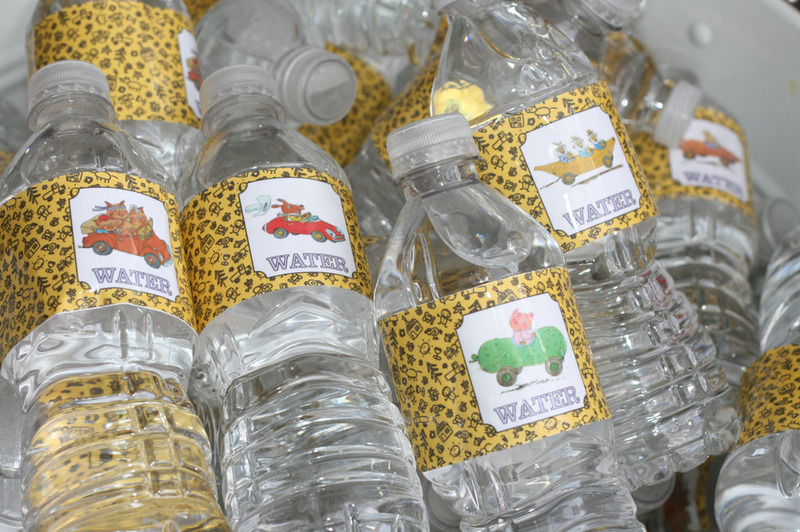 I used the same “Golden Book” pattern on the water bottles as I did on the favors. 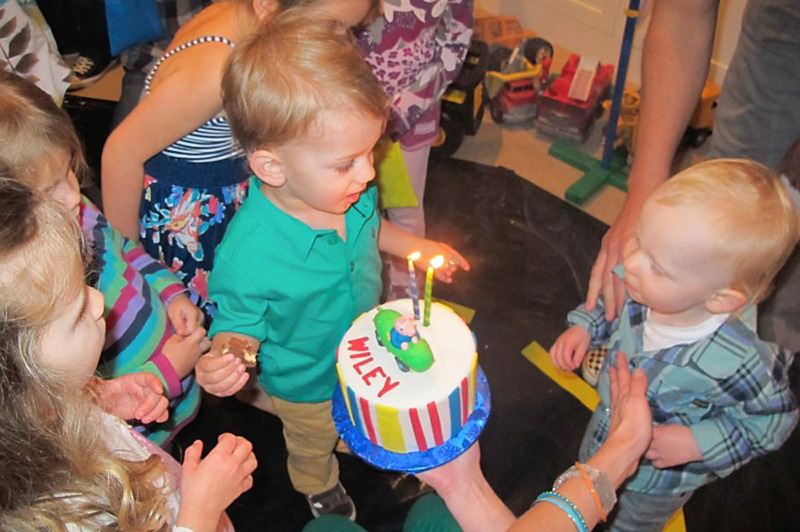 And life was good for the birthday boy who had about 10 cake pops and was seriously OBSESSED with his pickle truck cake. Part 3 tomorrow! Photobooth time! See you then! 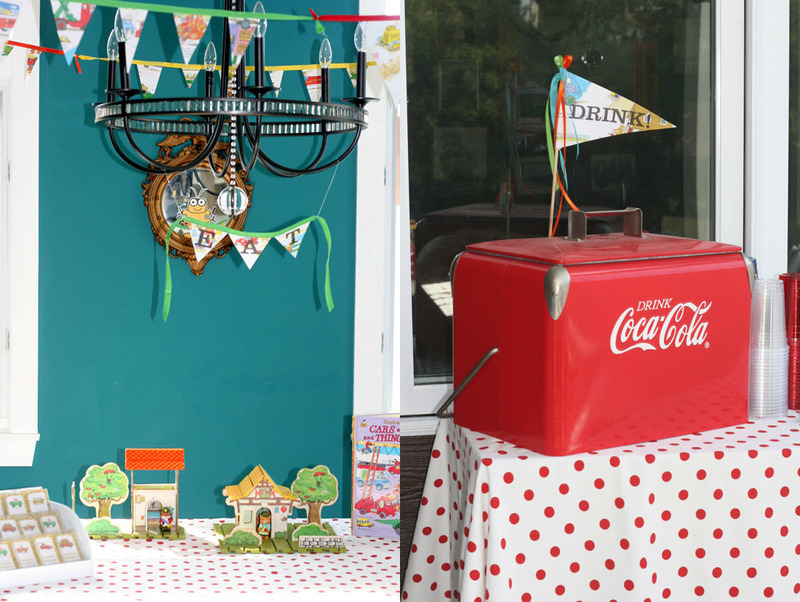 This entry was posted in kid's parties, parties for kiddos and tagged 2nd birthday party, busytown mysteries, busytown party, cake ideas, cake pop, cake pops, car cake, cars and trucks and things that go, cars party, dessert table, richard scarry party, truck cake, trucks party, vinyl road by Annika. Bookmark the permalink. Too much fun . 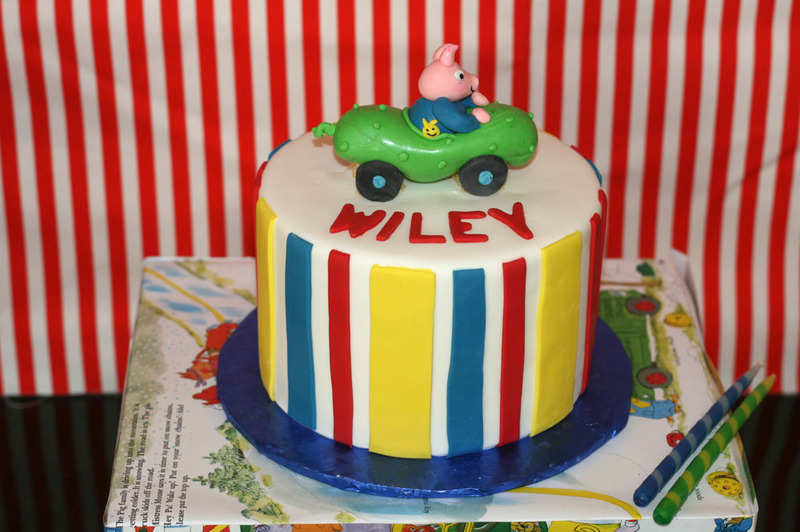 . . and I love-love-love Wiley’s cake and the way you mounted it on the covered box! SO super!